Building high quality backlinks is one of the biggest SEO factors and often the most confusing. In this article we are going to teach you how to build backlinks that will help get your website to the top of the search results. Backlinks are essentially hyperlinks that go from one website to another. An example of a backlink would be this what is a backlink? Notice you can click the words ‘what is a backlink’ and it will take you to an article about backlinks. This is what a backlink is. Another example of a backlink is a straight website address like www.powersuite.com again, when you click the web address it will take you to that website. I know what you’re probably thinking, ‘I can just go on a bunch of websites like YouTube and Facebook, paste my URL in the comment sections and get a backlink’. Wrong! It doesn’t work like this. The number of backlinks isn’t the only factor, it is the websites that are linking to your website that matter significantly. Google is aware of these cheap linking tactics and will penalise your website for being associated with them. Google considers where the link is coming from. A quality backlink will be from a website that is in a similar industry to your website and has a high domain strength (domain authority). A websites Domain strength (from 0 to 10) is a complex quality metric, calculated based on numerous key SEO factors (including domain age, backlinks, social signals, etc.). We use this metric to track how the SEO “strength” of your website grows over time as well as the benefit of have a backlink from this website. Before we dive into building backlinks, we are going to have to explain how to check a websites domain strength. As we mentioned earlier, you only want websites with a high domain strength linking to your website. So, before you start building links, it is important to check a websites domain strength. To check a websites domain strength, open Link Assistant and enter the URL of the website you what to check. On the left-hand menu click ‘Domain Strength’. In this screen we can see a score out of 10 of the websites domain strength, ideally, we want a website with a domain strength of more than 5 linking to our websites. Guess blogging is a powerful way to build high quality backlinks from websites in your industry. To find websites where you can contribute your content, try searching YourIndustry + Blog. Make a list of a few websites and check if they have a guest blogging section. Before you contact them about guest blogging, be sure to check their domain strength to ensure its strong. Considering guest blogging can be very time consuming we would recommend only reaching out to blogs that have a higher domain strength than 7. Another good way to find potential backlink opportunities is with SEO Power suite Link Assistant. 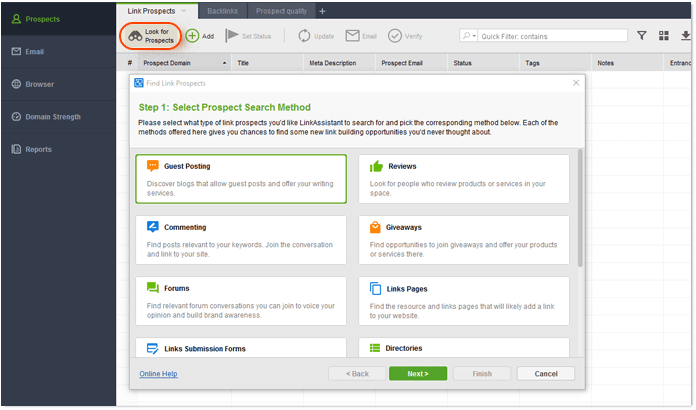 In Link Assistant enter your website URL, then click Look for Prospects. Here you will be able to choose from a variety of backlinking opportunities. Why are your competitor’s websites ranking before yours? With a little investigation into what they are doing you will have insight into some new backlink prospects that will help you overtake them in search results. One of the greatest programs for this is SEO SpyGlass. After entering your competitor’s URL, you’ll see an immediate overview of their link profile and its strength. Find websites they are getting links from and copy them. A great way to build quality backlinks is to provide in-depth reviews and case studies to your suppliers. For example, if you’re an accounting firm you can provide a review or case study on how your accounting software has helped your business. This works well because it is an instant ego boast for the company, they will often want to display high quality reviews on their website. Generally, they will want to include as many case studies as possible on their website. They probably have a high domain authority and they are related to your industry making them a great site to have a link from. Your NAP is anywhere your business name, address and phone number is posted on another website. These are generally online directories. The good thing about building your NAP on online directories is they all offer a link to your website. We often continue adding our business to online directories for the SEO benefits as opposed to hoping to generate more business from the online directory itself.